The Martin Yale Premier P7200 is a one of a kind machine in its category. Small and easy to store, this machine does most common folds and a continuous feed of up to 50 sheets of 20# Bond Stock. Able to accommodate most copy papers and letterheads, this unit is sure to be a success in any small office or moderate mailing environment. This machine is not recommended for heavier materials, card stock or glossy paper. 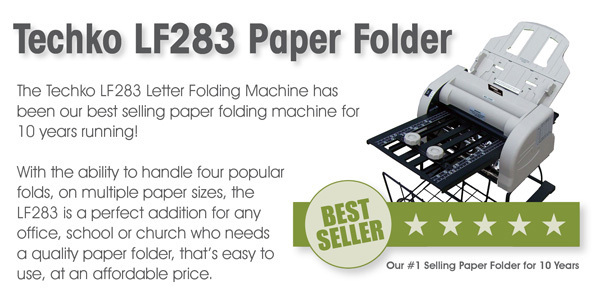 Great for use in mailrooms, office, schools, churches and associations. - Weighs approx. 16 lbs. Please keep in mind, as with all friction fed paper folders in it's class, that this machine is not designed for heavier card-type stocks or glossy paper.